For the application of an IP (for your computer or whatsoever device) please fill in this form. In case of maintenance requests, please fill in this one. All forms should be handed to the administrators in room U2065 and will be handled on a first-come-first-serve base within a few days. System administration support is also offered for your desktop/laptop computer. This involves installation, upgrades and specific adaptions. System administration will have exclusive Root/Administrator access. backups, and lot of others. 3) System administration group is installing and maintaining project oriented software and hardware services. Please contact. 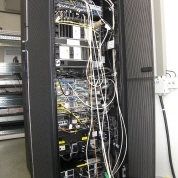 Maintenance, hardware and software errors and related queries should be addressed to system administration personally (see opening hours) and via email using this email-addy sysadmin@iup.physik.ini-bremen.de . This email list sends your mail to Peter Gruppe, Klaus Bramstedt, Heiko Schellhorn, Heiko Schröter and Marco Vountas. Responsibles will pick up your query and will get back to you as soon as possible. Note: Even though each of the colleagues have a personal email address, please DO NOT email your queries to these addresses, but send it to sysadmin@iup.physik.ini-bremen.de, otherwise we cannot ensure smooth operations in case of vacation or illness. Beyond default services „sysadmin“ is also hosting a local software archive from which you can download free software.